The ongoing proceedings of the three-member Judicial Commission formed to probe alleged rigging in the 2013 general elections, took another turn on Thursday when National Database and Regulatory Authority (NADRA) Chairman Usman Mubeen informed the commission that there was no need of magnetic ink to verify thumb impressions of voters and that unverified votes could not be equated with fake votes. “We do not have the expertise to check whether the ink was magnetic or not. We do not depend on magnetic ink as it does not bear any effects on the results of fingerprint verification process,” Mubeen told the three-judge commission headed by Chief Justice Nasirul Mulk. When asked by PTI’s counsel Abdul Hafiz Pirzada, NADRA chief Mubeen said that the Authority had submitted 39 reports to different election tribunals regarding the verification of thumb impression. He added that 97 per cent of readable thumb impression were discovered to be valid votes. “If thumb impressions are not readable, we resort to ID card number and check whether that is valid and falls within the respective constituency,” Mubeen said, adding that this process had helped the Authority in verifying 100 per cent votes. 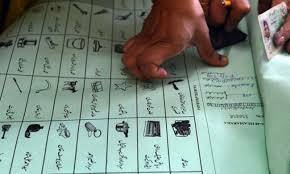 The NADRA chief further clarified that non-verification of any thumb impression does not mean that the vote is bogus. However, Mubeen admitted that the authority does have any fingerprint expert. Instead, the body had employed an Automated Fingerprint Identification System (AFIS) for verification of fingerprints. Replying to a question by PML-N’s counsel, the NADRA chairman explained that various reasons contribute to making a thumb impression unreadable, including unclean thumb, slight-cut on thumb, Henna applied on hands, scratch/line on thumb impression, wrinkles on the thumb due to age or thumb not properly applied on the paper. He also stated that the AFIS system was introduced in 2005. Under biometric verification process, people were asked to visit NADRA centers and re-submit thumb impressions. In this regard, over 681,000 people verified their thumb impressions. Earlier, the PML-N lawyer told the commission that it should be clarified that how many ballot papers were printed for all the national and provincial assembly seats and how many were demanded by the District Returning Officers and Returning Officers. The commission’s hearing will resume on Friday (today). Meanwhile, the Pakistan Muslim League-Quaid (PML-Q) on Thursday withdrew the names of director generals of Inter-Services Intelligence (ISI) and Military Intelligence (MI) from its list of witnesses. Earlier, while submitting the list PML-Q had requested the commission to summon both DGs for recording their statements regarding the alleged rigging in last general elections. PML-Q chief Chaudhry Shujat has submitted a revised list wherein the party has not only excluded the names of both spymasters but also deleted the names of registrars as witnesses. The commission has been requested to summon ROs, who conducted the election in different constituencies including NA-61, NA- 67, NA-104, NA-134, NA-140, NA-142, NA-164 and NA-186. These ROs should be asked that why they did not issue mandatory notices to the contesting candidates under section 39 R0PA 1976.